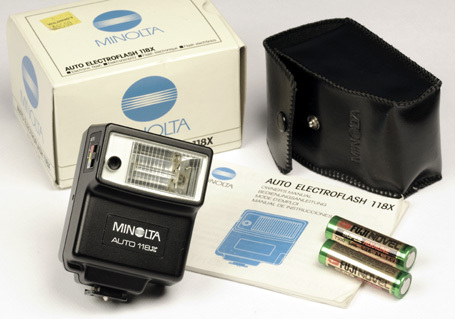 In 1976 Minolta did it again: came up with something no-one else had done before and presented it in a unique and impressive package. The novelty part of the new release was twofold; a single lens reflex in pocket size equipped with a zoom lens. The shape of the camera also set it apart from the rest, although it could be argued that this was more likely an attempt to retain the conventional pocket camera format as much as it was possible, rather than creating a radically new SLR design. Whatever the background was, this camera was definitely a head turner in the late 1970's and is still able to provoke some puzzled looks at today's camera fairs. Although the Minolta 110 zoom SLR is unusual, it is not uncommon. During its four years of production many were sold, so nowadays they frequently turn up at camera markets or on Internet auction sites. 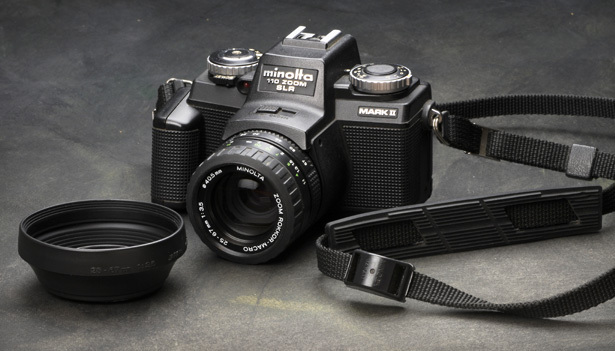 Nevertheless, every Minolta or sub-35 mm film camera collector should have one, as they are a landmark camera. 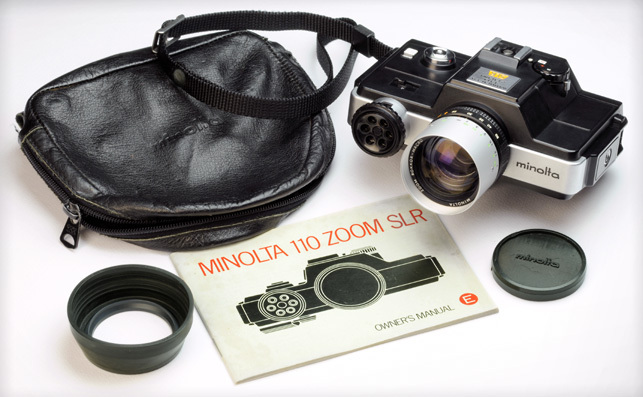 The Minolta 110 zoom SLR was offered in a package similar to the one below. The owner's manual also mentions a set of nine (!) eye correction lenses (from -4 to +3 diopter) and a couple of filters (UV and yellow) specifically made for this camera. The filter diameter is 40.5 mm. With these items the range of optional accessories is exhausted. Not that you would particularly need any other gadgets for the kind of snapshots this camera is best suited for. The 25-50 mm zoom range (approx. 50-100 mm 35mm film camera equivalent) provides a measure of flexibility. Wide angle is absent, but then again, with a frame size of only 13x17 mm you wouldn't be thinking of recording sweeping landscapes. There is a limit to how much detail one can cram into such a small frame. On the other hand, as many of its owners would have taken this camera with themselves when traveling, a wider angle lens would have come handy in close spaces such as narrow streets and inside historic buildings. The closest focusing distance is one meter, however, there is also a macro mode. Now let 's get down to the technicalities and see how this camera works. Firstly, as far as measuring the available light and controlling the exposure are concerned, this camera is automatic. One only needs to decide on the appropriate aperture and set this on the dial next to the lens and the camera will automatically set the shutter speed. This can range steplessly from 1/1000 sec. to as slow as 10 sec., which is quite amazing. The CdS light meter is behind the dial. Obviously, the light meter and electronically controlled shutter need batteries to operate. The two 1.5 volt button cells (Eveready S-76 Silver-Oxide or equivalent) are in a recess on one side of the camera. (Thankfully, they are not in the film compartment as in the Pentax auto 110, so if they fail in the middle of a film, they can be easily replaced.) There is a red battery test button on top of the camera - press that, and if you see a red light glow in the viewfinder, then the batteries are serviceable. A fresh set of batteries should last for about a year under normal conditions. The aperture settings go from f/4.5 to f/16. This doesn't make it a very fast lens, but that is the price to pay for the zoom capability. (Mind you, this lens has 10 elements in 10 groups, so it is not a simple lens.) The only problem is, that the viewfinder is of the porro-mirror type, which is also not exactly bright, so the two factors combined make the viewfinder image rather dim. What aids the focusing, though, is that with this zoom lens it is possible to focus at the 50 mm end and then re-zoom to the required magnification without loosing sharpness in the process. The focusing aid is a central microprism spot. The viewfinder frame shows only about 85% of the actual image captured, which is not really helpful when one tries to make the best use of a tiny film area. While on the viewfinder, let 's see what viewfinder information is available. There is not much. Basically there are two arrow shaped lights near the right edge of the frame. The upper, red arrow lights up when the battery test button is pressed, or when there is a danger of overexposure. The arrow indicates the direction the aperture selector dial should be rotated in to correct the problem. The lower, yellow light turns on when the shutter speed falls below 1/60 sec. to warn that some camera support is advisable, unless a wider aperture is used. The tripod socket is located on the side, rather than on the bottom. 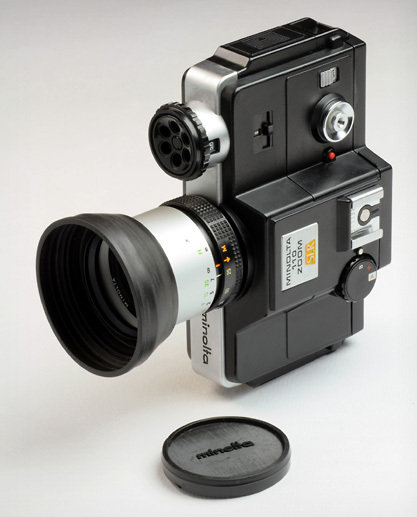 When the camera is stood-up on its side in vertical orientation, it resembles a movie camera, as on the picture below. Automatic operation is selected on the mode dial by aligning the A symbol with the index mark. In situations where the light meter is likely to give incorrect readings (e.g. back-lit subjects or when the subject is against a dark background), one can use the compensation control on the top right of the camera to alter the exposure within a +2 to -2 EV range. The mode dial also features a X and a B symbol. These are for flash and time-exposure photography, respectively. At both of these settings the camera operates in manual mode for which no batteries are required. (Before turning the mode dial, release the safety lock by pressing the white button on its side.) The flash synchronisation is 1/50 sec. Only a hot-shoe is provided, there is no PC flash socket. 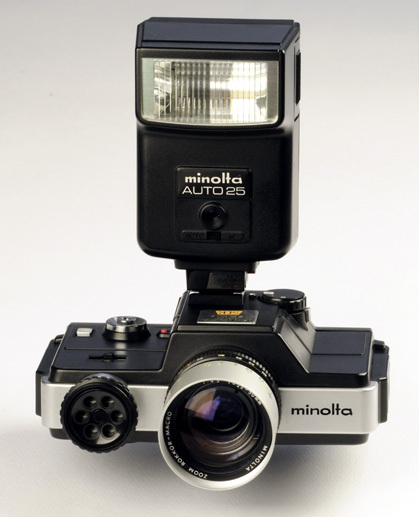 Minolta recommends the use of the Auto 25 flash (pictured). It should also be noted, that when taking pictures with slow shutter speeds, the shutter release button has to be held down until the shutter closes and the mirror returns to its normal position. Letting go of the shutter release button prematurely results in incorrect exposures. The 110 zoom SLR is also capable of taking close-up (or 'macro') photos. This works in the distance range of 28.6 - 30.7 cm (measured from the film plane). This translates to subject sizes of about 11.3 - 14.9 cm. To set the camera into macro mode, first align the orange arrow on the zoom ring with the orange index mark, then push in the zoom ring and turn it to the left, so that the M is against the orange index mark. Internally, this will bring into position another lens element that reduces the focal length of the lens. 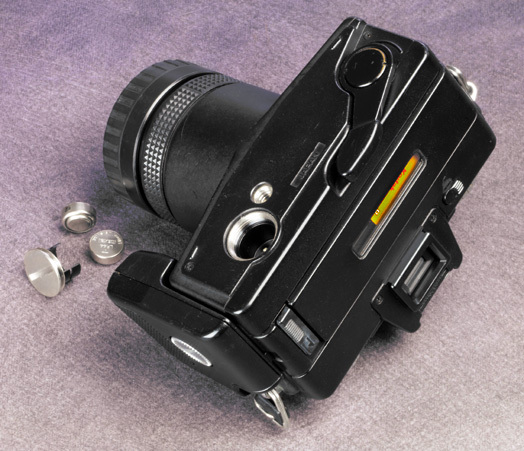 To load the camera with film, open the back by sliding the little latch next to the viewfinder window to the right. I'm told that the camera recognises two film sensitivities; 100 and 400 ASA. (The film cartridge has a ridge along one side, and the length of this ridge indicates the film sensitivity.) An easy solution to using a film with a different sensitivity is to make use of the camera's exposure compensation function. 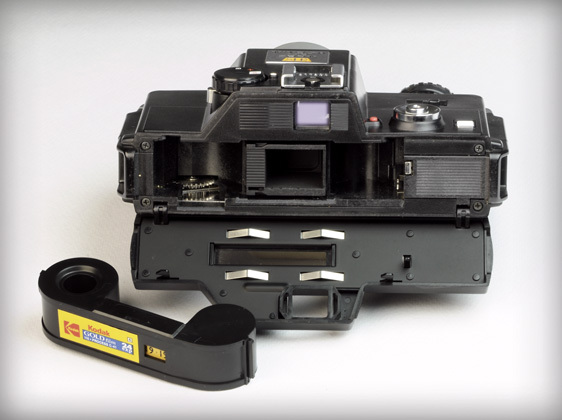 It takes about three full strokes with the film advance lever to advance the film to the first frame. You will see a couple of 1-s through the back window and the film advance lever will also lock. 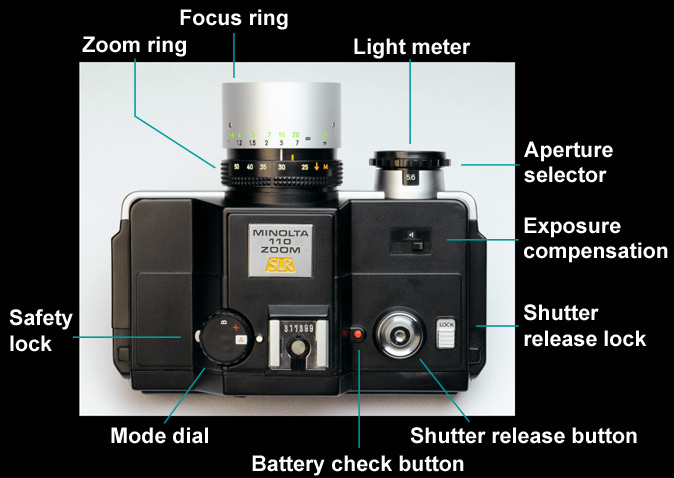 As a safety measure, the shutter release button won't be operational until the film is properly advanced. The location of the film advance lever is rather unconventional. But this should not come as a surprise after seeing all the other unusual features. The Minolta 110 zoom SLR is a truly remarkable camera. 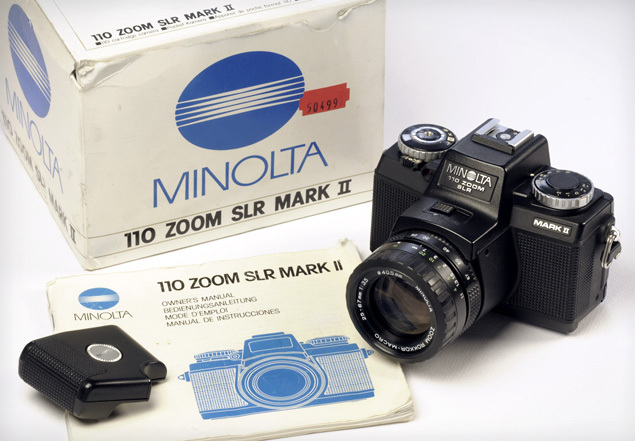 In 1979 Minolta replaced the original 110 zoom SLR with an advanced model, the Mark II. This camera is more of a conventional design. It is dominated by a huge zoom lens with a slightly larger telefocus range than its predecessor's. It also comes with a removable hand grip. The manual I got with the camera is written in four different languages all intermixed almost paragraph by paragraph. It is a novel idea, but makes for a very difficult read. The Mark II stretches the concept of the pocket size camera. Think of a winter coat pocket rather than the pocket on a jacket. However, at only 485 grams it is still easy to carry around. The Mark II functions in a similar manner as the previous model. The operational modes are the same, however, the slowest shutter speed has been cut back to 1/4 sec. I wonder if this is due to the placement of the CdS light sensor; it is now behind the lens in the pentaprism housing. Having gone through several optical elements, the intensity of the light might not be sufficiently large to drive the system in low lighting conditions. (Remember how Canon developed separate light meter booster finders for their Canon FT, Pellix, and F1 models.) As a plus, the lens now has a wider maximum aperture - f/3.5 - and the zoom goes as far as 67 mm. And, of course, macro capability has been retained. The camera uses the same 1.5 volt button cells as the previous model. The LED indicators in the viewfinder are somewhat more sophisticated. There is a list of discrete shutter speed values from 1/1000 to 1/60 along the left hand side and a led lights up next to the one chosen by the camera in automatic mode. There is also a number 4 below the 60, which stands for 1/4 sec. If the shutter speed is between 1/60 and 1/4 sec., an oblong shaped led lights up near these numbers, but naturally, we don't know what the exact shutter speed will be. 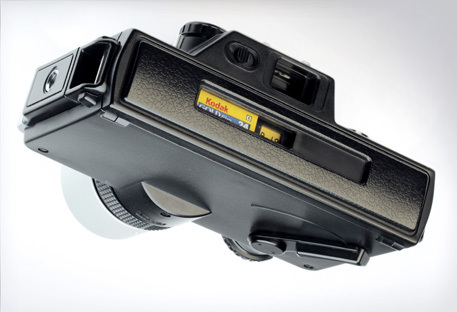 The pentaprism viewfinder is brighter than the earlier porro-mirror type. 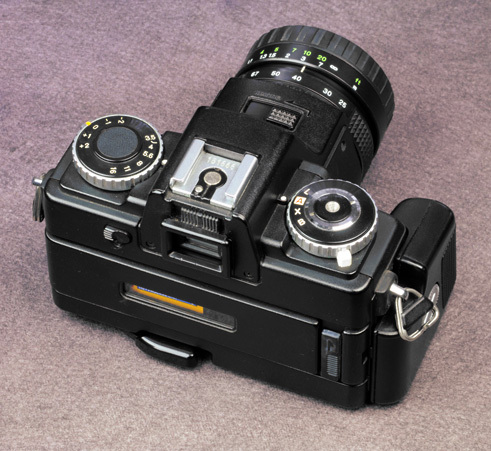 There is now a split image rangefinder spot focusing aid, not the microprism we saw in the original 110 auto SLR. Whether or not this is better is up to personal preference. The viewfinder also features an eye-piece correction slider. It only goes from -1.1 to +0.8 diopter, but clip on correction lenses are also available. Perhaps more importantly, the frame of the viewfinder window has been formed in such a way to accept the Vn magnifier and the V right angle finder accessories. These accessories are tremendously useful in macro photography. The viewfinder has an inbuilt shutter. Interestingly, this shutter closes briefly, when an exposure is made. New to this model is a self-timer. The switch is in front of the mode selector. Battery check is performed with the same switch by pushing it the other way. The batteries are OK, if the red LED in front of the switch lights up. This same LED blinks during count-down when a delayed action photograph is taken. The matching flash to use with this camera is the AUTO 118X. 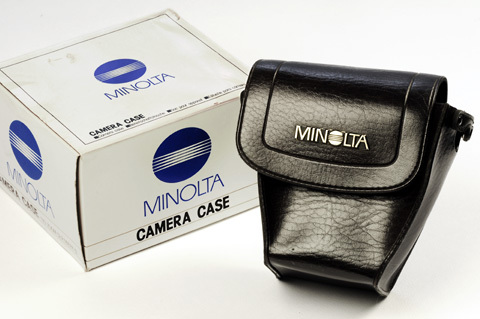 Minolta also made a leatherette case for the Mark II. So, which camera is better, the 'Mark I' or Mark II? I think the original model is interesting due to its odd shape and the unconventional layout of controls, but the more recent version is a better user. However, with prices as low as they are, one is not forced to make a choice - get both! [29-Mar-2011] At last weekend's camera market I finished my usual round around the tables earlier than usual. Not wanting to call it a day yet, I decided to wander around once more, but this time look under the tables where some sellers had put their less valuable excess stuff. Here, in a junk box I found this Minolta 110 Mark II. The seller said 'make me an offer', I said 'ten dollars', and he waived OK. It came in a case and had a strap and a lens hood, too. Best of all, when I tried it out at home, it worked perfectly. But there was another reason for me to get excited about this camera. 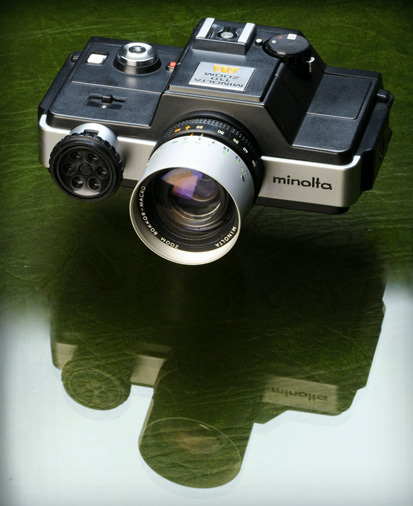 Look at the Minolta logo - it is the old style minolta logo. (The case, too, had this badge on it.) I also like the shoulder strap with the little compartment for spare batteries. The collapsible rubber lens hood was specifically made for this camera - the lens' particulars are printed on it. It is a good quality hood with a metal ring embedded in it, so that it does not deform. A filter can be screwed into the hood. The mount diameter (both filter and lens hood) is 40.5mm.